I love almost all desserts. 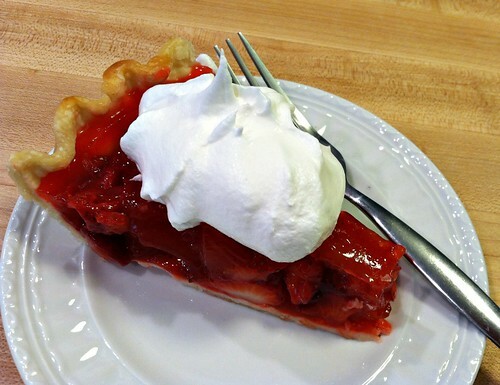 However, if given a choice between any dessert and strawberry pie, I will probably choose the strawberry pie every time — especially if it’s made with MY recipe and fresh-from-the-garden strawberries! Well, I suppose it’s not actually “my recipe”. It’s the same recipe my mom uses — and I think the same recipe my grandma uses. It came from a good old-fashioned church cookbook back in the day… and in my humble opinion, it’s the very best strawberry pie I’ve ever had. Any time I bring this pie to a potluck or group function, I always get asked for the recipe. Of course, I’m happy to share, especially since people are often shocked by how simple it really is. Bake pie crust according to package directions. Set aside to cool for about 20 minutes (or longer if you want to bake the crust earlier in the day). In a medium sauce pan, combine water, sugar, and cornstarch. Cook over medium heat (stirring frequently) until it comes to a boil. Continue cooking for 2 minutes — stirring constantly. By swapping out the gelatin and the berries for other flavors, you can make raspberry pie, blueberry pie, blackberry pie, triple berry pie, etc. Just match the flavor of the gelatin to the type of berry you’re using (or mix it up for a new flavor). So quick. So simple. So delicious! What is your favorite way to eat fresh spring strawberries? I just made this pie tonight. Can’t wait to try it tomorrow! It looks delicious! If I make a pie (let’s say Wednesday) to serve on Thursday night. Do i have to leave it refrigerated all night and day until I serve it? I am just learning how to cook and want to know how long to leave it in the refrigerator. Thanks! I’d leave it in the refrigerator — it will be fine for 24 hours! Looking forward to making this on Memorial Day!!! My all time fav is strawberry shortcake, homemade of course!!! and I also own the bragging rights for my banana cream pie!!! YUM!!! In response to Becky, I have a yummy strawberry pie recipe that I use the frozen strawberries that I buy at Costco if you are interested!!! I just finished making this pie and letting it cool a bit before putting it in the fridge. I’m excited about Dessert tomorrow! I was making this for company this evening and, umm, accidently stumbled on a variation. You see, when took out the strawberry jell-o, I also took out a package of instant vanilla pudding, as my 5first year old and I were planning on making homemade pudding pops. When I reached for the jell-o, I wasn’t really watching and grabbed the pudding instead. I had dumped the pudding in the cornstarch/sugar mixture before I realized what I had done. I then thought “Well, why not?”, and added the strawberry jell-o too. The pie now tastes like strawberries and cream, its sooo good, if not a little rich! This iS a delicious recipe, but you can REALLY take it “over the top” when you make a strawberry pie like this and use RASPBERRY jello, instead of strawberry jello!! Please try it once, I did, and never went back! Yes Ann, I’ve done this too. I personally prefer to stick with the strawberry/strawberry and raspberry/raspberry combos — but I do mix it up every once in a while! This is the same recipe I use and it is also my favorite! I usually make it with a graham cracker crust though. 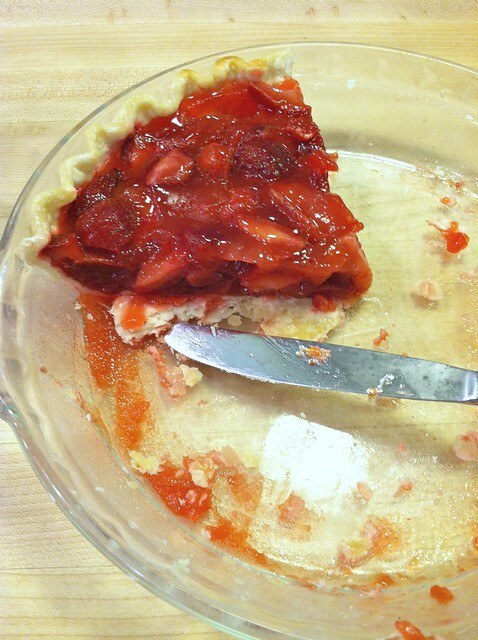 My mom had always made strawberry pie this way….it is SO good! We do peach pie like this too! Strawberry pies always remind me of my mom. She loves strawberry pies! We have just taken milk out of our daughter’s diet. A nice strawberry pie might make her forget about ice cream… Maybe. Would this possible work with frozen berries? Have you tried it? No Becky, I definitely don’t think it would taste good with frozen berries. 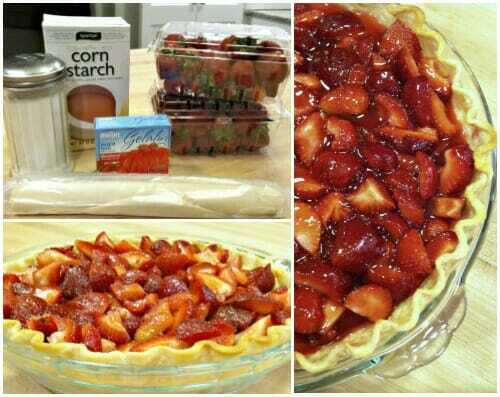 This is essentially a “fresh” pie and since you don’t bake it, you’ll need to use fresh strawberries so they are nice and crisp. Frozen berries would be soggy and a really bad texture for this recipe. I’m sure she’ll love it Lisa! I’ve used this recipe for years, too…….so easy and so delish!! Better go get myself some strawberries right now!! This is MY recipe, too! 🙂 I usually leave the berries whole, instead of slicing them, as it makes a more impressive presentation. Always a winner! My recipe too!!! My husband always wants this instead of birthday cake for his June birthday!!! 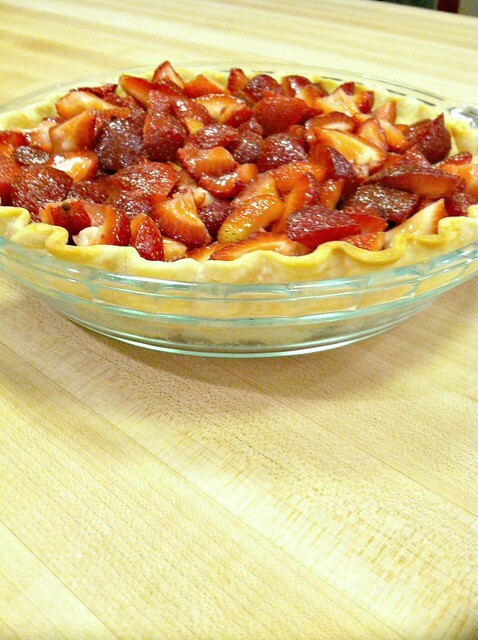 I have actually never made a strawberry pie! Looks delicious! I love to eat fresh strawberries on top of homemade ice cream! YUM! This post is making me love summer even more! This is my favorite dessert of all time also! It is so delicious! 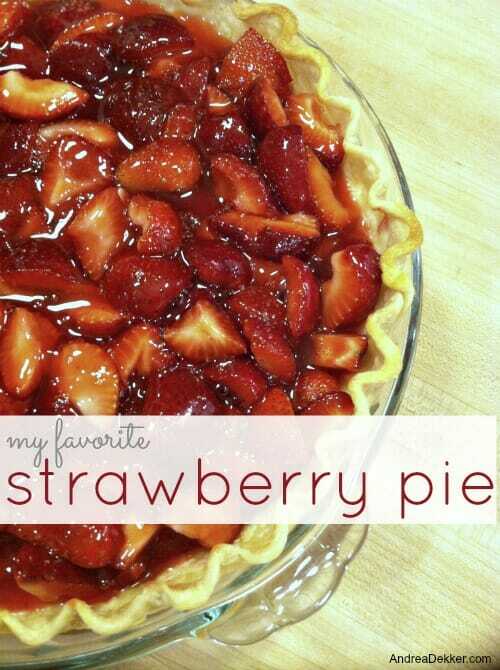 Strawberry pie sounds delicious! I can’t wait to try the recipe. Thanks for sharing! Hmm was going to make strawberry shortcake in addition to a birthday cake for my sons 4th b-day party this weekend, but maybe this pie will be made instead! Have you tried this with splenda and sugar free jello instead of regular? Have a couple family members who have to watch their sugar intake. Audra, I’ve used sugar-free gelatin many times — but I’ve never tried splenda. I’d definitely try the recipe as written first so you have something to compare it to before trying it with Splenda. This pie is really good, but you’ll want to make sure you have plenty of time to refrigerate it — maybe it will be a bed-time snack if it’s not “set” before dinner!